(Top left to right) Kelli McGroarty, Stella Kahn, Coach McGroarty, Olivia Alves, Nicolette Scarduzio, Coach Megan Liberti, Riley Tiernan, Klio Kokolis, Coach Bob Bry (front) Rebecca Spence, Sara Brocious, Cami Silvestro, Emily Eustace. The Eastern Regional Girls Soccer Team was crowned state champions this past fall and congratulated at the February board of education meeting. The Eastern Regional High School Board of Education held its monthly meeting Wednesday, Feb. 27, discussing the past, present and future of Eastern. 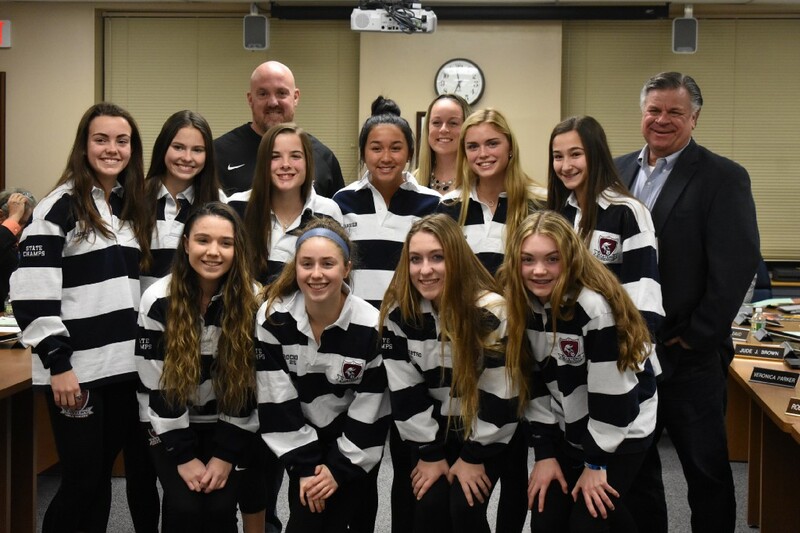 Superintendent Harold Melleby and the Eastern board members welcomed the girls soccer team to the meeting for an early reception, celebrating the team’s South Jersey Group IV state championship this past fall, in which it went 25–2–1 during the year. The team also finished the year ranked second in the state and ninth in the country, according to vice principal of athletics Jason Hill. As for individual accolades, the team was comprised of outstanding talent in multiple aspects on the field. The team also won additional awards, both as a team and as individuals, throughout the season. Lastly, Coach Jamie McGroarty will be inducted into the New Jersey Scholastic Coaches Hall of Fame in March. During the business portion of the meeting, board President Bob DeCicco announced the board held an executive session prior to the meeting in which it interviewed candidates for the open position on the board for the representative from Gibbsboro. The open seat was created at January’s meeting after board member Craig Speechley announced he was stepping down from his position due to personal reasons causing him to leave Gibbsboro. According to Business Administrator Diana Schiraldi, the board interviewed two candidates during the executive session, which led to the appointment of Dennis Deichert by a 7–1 vote, with the only “no” vote coming from board member Veronica Parker. Deichert will finish out the calendar year with the board of education, after which the winner of the election for the unexpired term this November will finish out the remaining years of the term. Deichert will take office on March 20, the date of the next board meeting. Deichert previously served with Eastern’s board for 12 years before leaving in 2018 to serve for one year with Gibbsboro Council. Schiraldi announced the approval of Eastern’s annual audit, saying it was good for the district, having come with no comments or recommendations. During the meeting, School Security Specialist William Westerby presented the Student Safety Data System 2018–2019 Mid-Year Report, as required by administrative code. According to Westerby’s report, Eastern Regional saw 10 acts of violence, including seven fights, between September and December of this past fall. The school had four alleged HIB cases, however none were confirmed. There were nine cases of substance use confirmed, and one incident of possession by a student. Lastly, there was one incident of a student with a weapon, which was a knife. In dealing with substance abuse, Westerby said an overwhelming majority of cases are in reaction to vaping, either with nicotine or THC oil. Melleby said he, along with other county superintendents, plans to meet with the Camden County Prosecutor to discuss multiple topics, one of which being the topic of vaping in schools. The board awarded the bid for the Roof Renovation Project to Robert Ganter Contractors, Inc. in the amount of $1.598 million as the “lowest responsible bidder” for the project. The board received nine bids for the project that will be completed over the summer. The next meeting for the board is on Wednesday, March 20, at the administration building at 7:30 p.m. However, an early reception will be held at 6:45 p.m. to honor the girl’s field hockey team and its championship season.